In 1961, German Hanns Trippel would launch the Amphicar as the worlds first mass-production amphibious car at the New York Auto Show. A racing driver turned engineer who ran Bugattis Molsheim, France plant during the German World War II occupation, it was said that Trippel was obsessed with producing a viable water/road-going combination. In fact, it is believed that he built over a thousand prototypes before the successful launch of the Amphicar. Trippel had also gained notoriety for engineering the world-renowned and now iconic Mercedes-Benz Gullwing doors. The Amphicar was built in Germany between 1961 and 1968, with a total production of approximately 4,500. It is estimated that 3,046 of these Amphicars were imported to the United States between 1961 and 1967. The Amphicar would offer a four-cylinder rear engine built by Triumph Herald that was capable of 43hp. On the water, the Amphicar could reach 7 knots, while on the land it had a top speed of 70mph. Thus, the car was often referred to as the Model 770. All Amphicars were convertibles, and were originally offered in just four colors: Beach White, Regatta Red, Lagoon Blue and Fjord Green. Looking to purchase an Amphicar? If youre thinking about buying an Amphicar, it is important to remember that these cars require much more maintenance than the typical classic car particularly if you plan on using the car in the water. Even when new, the Amphicar was considered as a mediocre car and boat; yet it is one of the most fun cars you could own. Youll likely be doing a lot of tinkering and maintenance. It is also important to keep in mind that Amphicars typically have low mileage, most likely because these were considered second-cars or recreational vehicles for most owners. As with all classics, it is in your best interest to find a low-mileage Amphicar that is in the best condition you can afford within your budget. Similarly, youll want to consider the cost and time demands of restoration. Finding Amphicar parts can be difficult and costly, and restoration of these unique autos can take years. While these considerations are not meant to keep you from buying an Amphicar, youll want to ensure you have a full understanding of the overall condition of any example you are considering purchasing to make the most informed decision you can. These are just a few of the many Buyers Tips that The Beverly Hills Car Club has learned over their years of experience in the classic car market. 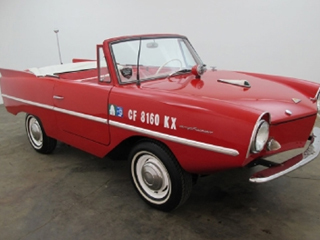 To learn more about the Amphicar or to explore the models currently available in their Los Angeles classic car dealerships inventory, do not hesitate to contact them today. They look forward to hearing from you and to helping you find the classic Amphicar you desire. Connect now to get started! We Also Buy Classic Amphicars In Any Condition, Top Dollar Paid.